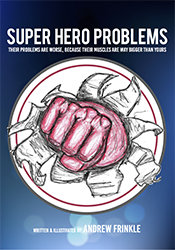 This 7x10 inch full color picture book features 20 original comic book characters, all with snarky villains hating on them and a slew of personal issues. It's not always easy being a hero. Unlike some of my other books, this one is intended for middle to high-schoolers.